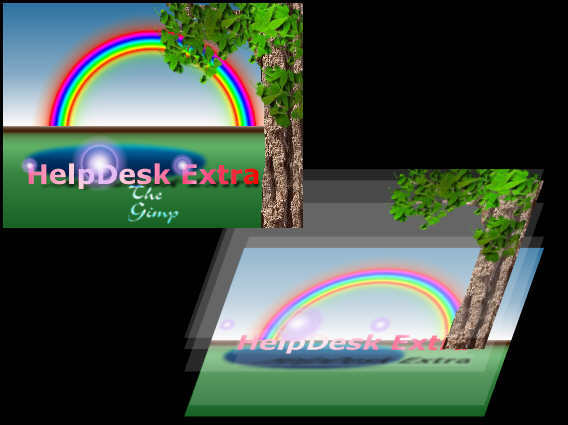 This month, Paul Grosse gives you more insight into some of the topics dealt with in HelpDesk and HelpDesk Extra. 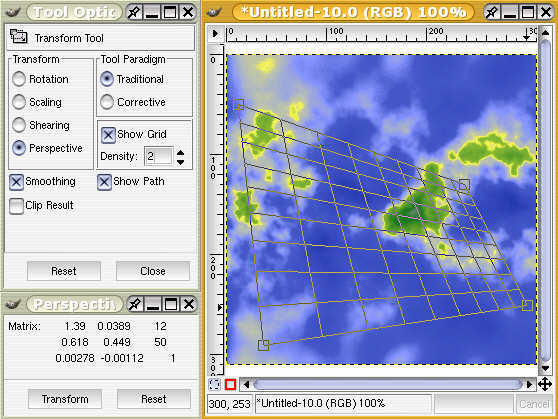 Tool Options -- Fuzzy Select, Blend tool. If you have ever needed to look inside something or see something close-up, the ideal answer is of course, the endoscope. However, using a highly specialised piece of medical equipment that can be sterilised to look inside your printer or take photos for your son's school project on arthropods; or the many, small, flowering, non-grass plant species that occupy the place in the garden where the lawn used to be before you became interested in computers, you perhaps need to look at some of the solutions that cost less than a mainframe to buy. The camera on the right was bought for only £20 and is around 17mm across (diagonally) so it will fit into some fairly small holes. It also comes on a thin goose-neck that is around 30cm long and on the other end is a USB plug -- the intention being to plug it into the USB port on the back of your laptop, bend it into position and use it as a webcam. It will focus from around 30cm to infinity and gives a reasonable picture. In order to make it see things that are a little closer, I have taken the frame counter lens from a disposable camera and (it just happened to be the right size and about the right power) secured it in the lens recess with some Blutak. With this in place, it will focus on things that are around 15mm from the lens with the sort of depth of field that you would expect from such a short lens. 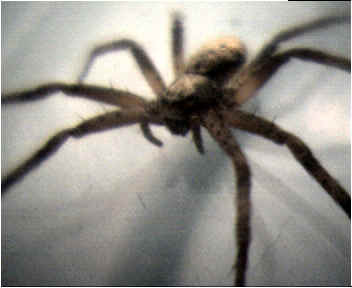 Note that you can see the hairs on the spider's legs but the plane of the object that is in focus is fairly thin and legs in front and behind are out of focus. The coin fits nicely in the focal plane but one thing to remember is that these lenses were never meant to do this job. To get a flat field of focus, you need a special lens that is made for the job. 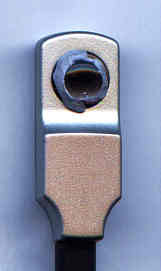 However, the pictures that it does produce are reasonable and are certainly good enough for recording identifying scratch patterns or other details of things. 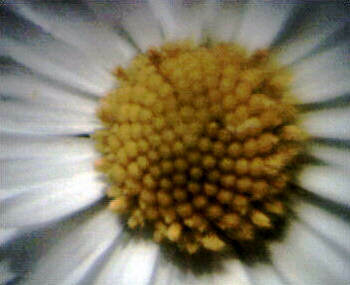 The centre of the daisy on the right is just 5mm across. 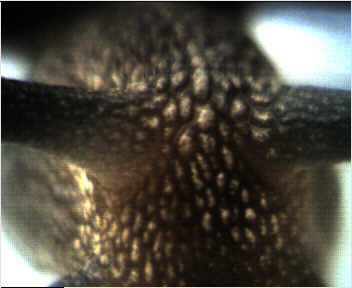 If you want to get much closer than this, then you probably do want to use a microscope but for this intermediate zone, this is ideal. This peculiar looking surface is not the upper surface of a new super-bike or a space-age interior furnishing but the head (for want of a better word) of a snail. 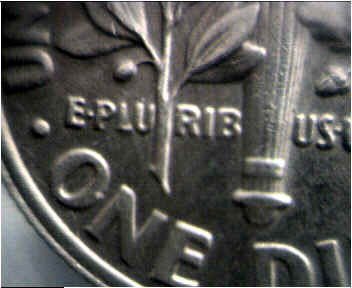 Again, it is less than a centimetre across and, like all close-ups, the depth of field is fairly small. 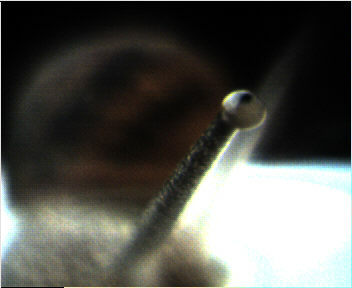 You can see that this is even more obvious in this close-up of the snail's eye, where only the eyeball and a small part of the stalk are in focus. If only we could get a camera that small. You might wonder why there are no pictures of mammals -- this is because, although I was capturing the frames using a piece of video editing software so that I could pick a good frame that was in focus and had reasonable composition (also, this webcam doesn't take stills), Bubbles the Hamster and Aphy the mouse wouldn't stay still long enough (clearly the snail did). I've never seen a hamster eat cheese before. Never work with children and animals. Setting it up on a Windows machine is fairly straightforward so we will concentrate on Linux where there is less support for this. Once you have followed the instructions on the printer server, you will need to let the machines on your network know that it is there. One way of doing this is to put its address and name in a file with the list of hosts. 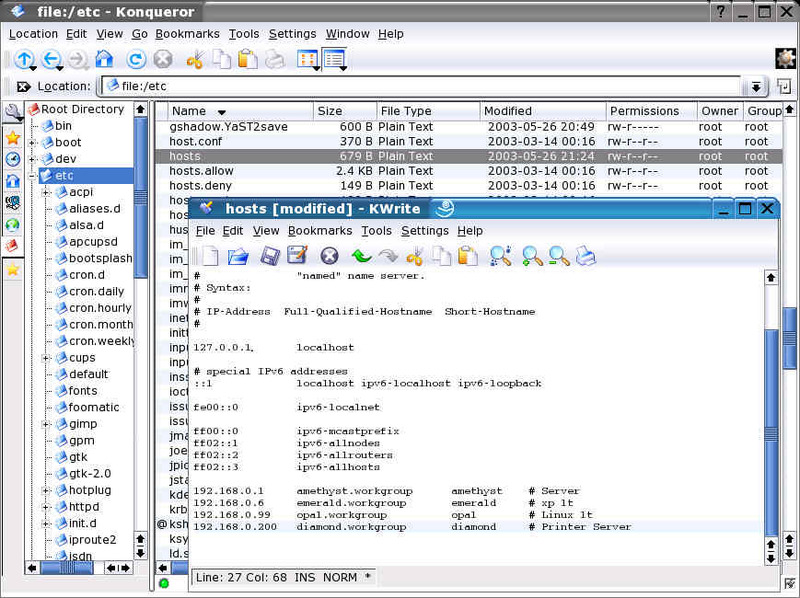 Each line has: the IP address; Fully qualified host name; Short host name; and then, any remarks. Remarks begin with a # and each field in each line is separated by spaces or tabs. With the hosts file containing the name for the network printer address, things can look a little friendlier -- note that the hosts file is really only a solution for small networks with a fairly static population. Go into the Control Centre and under YaST2 modules/ Hardware/ Printer/, install a new printer. If your printer was connected through another computer, you would use SAMBA but here, we are printing through a printer server so select Direct TCP Port Printing and follow the instructions regarding the name of the server and so on -- YaST will search the network for any printer servers and display them so that you can choose the one you want. The printer will be installed so that it uses CUPS. With the printer installed, you can configure CUPS on the local host using a web browser. Note that here, we are configuring effectively the CUPS printer driver/ spooler on this computer and not the printer itself. This is done by typing http://localhost:631/ where port 631 is a recognised port number. Note that the printer location is the name specified in the hosts file (in this case Diamond on 192.168.0.200) and the port is 9100. From here, you can look at the queue status, print test pages, kill jobs and so on. This is the Printer server configuration screen, again on a browser although this is a different machine, one running Windows xp. This is done by typing http://diamond/ and from here the printer server itself is configured. Rather than have a single MDI (Multiple Document Interface) within which are all of the components sit, the Gimp produces a number of small windows which, while seeming a little bit messy to Windows users, actually allows you to utilise the fact that under Linux, you can have multiple desktops and therefore, you can have different windows on different desktops as necessary whilst using the sticky button to make other windows appear on all desktops -- one use of this is grabbing screenshots which need to have one background but then can be carried over to another desktop where they can be processed without those processing windows getting in the way of the screenshot. But this program was not designed just for computer journalists getting pictures for their work. 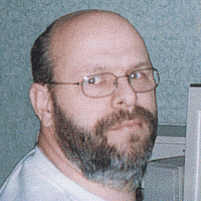 The image itself which can be blown up or shrunk down as much as you like by pressing [=] (which has the "+" on it) or [-]. It is also advisable if you are doing detailed work, to have another view of the image, showing all of it so that you can see the overall effects of any editing you do. To get an extra image, just right-click on the image/ View/ New View and it will be changed in real-time. Detachable menus can be generated by clicking on the dotted menu item that appears on each menu. Once you have finished with them, just click on it again. Another general tip is that if you are displaying a small portion of the image, you can click on the move icon in the bottom right of the image window. Doing this will make a small version of the whole picture appear with the part you are looking at in a small window. You can move this around the image and the view in the window will move in real time. 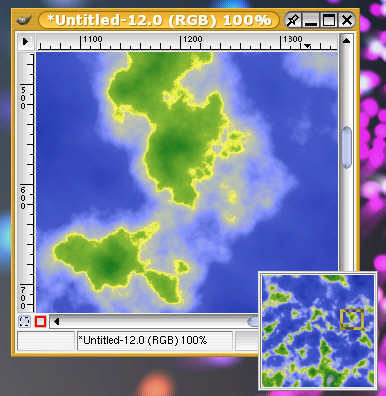 One of the features that makes the Gimp more flexible than other image editors is the fact that is uses layers -- the equivalent to "objects" in Micrografx Picture publisher. In the screenshot on the right, you can see how the image is made up from various layers: each of which alters the output from the layer below. The advantage of doing this is that should you decide that you weren't particularly happy with the content of one layer, no matter how long ago it was laid down, you can still edit it. 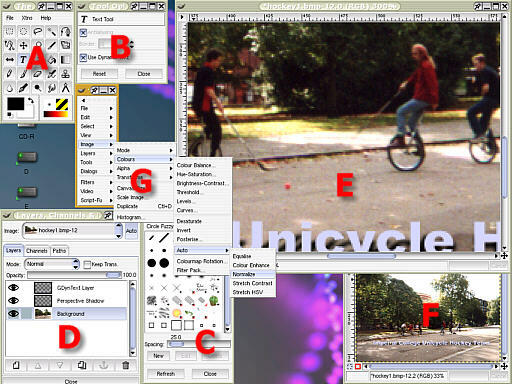 In the screenshot on the right, you can see the composite image and the layer manager on its left, showing the different layers. Note that you can also change the transparency of each of the layers. 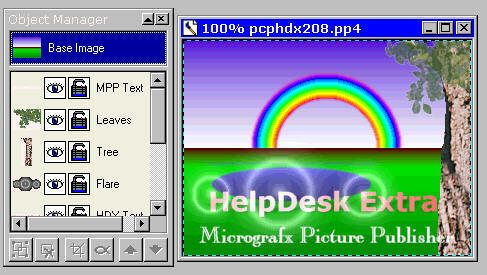 This screenshot is from a parallel process in Micrografx Picture Publisher . Note that it also uses layers but these are called "objects"
Gradients are particularly useful for fills into masks and whilst many images editors have a gradient fill function, the gradients with the Gimp are particularly versatile. 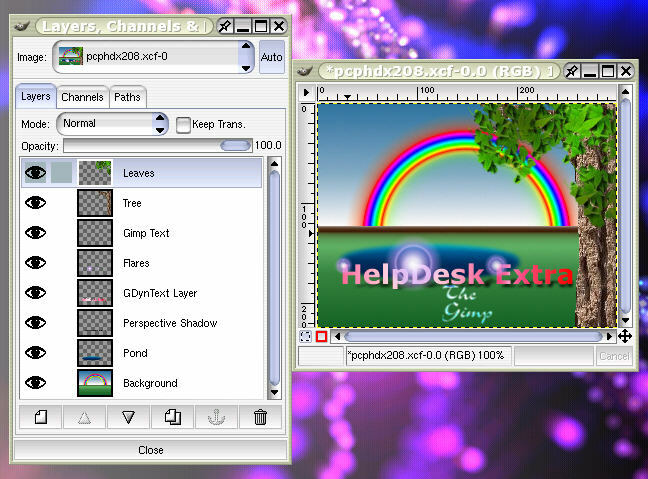 In a number of the Gimp functions, where a gradient is needed, clicking on the gradient box will bring up dialogue box A in the shot on the right. Pressing the edit button on this form will bring up dialogue box B which has a list of all of the gradients on it. You can edit or create as many gradients as you like with a single use of this dialogue box and the changes you make are live. Here, we have a test gradient C. At the bottom of it are the arrows (D) that define each segment. Moving each segment's central arrow around will shift the centre point of the segment. Holding down [shift] will allow you to select more than one to work on at any one time. Right-clicking on this area will bring up the menu which has a number of options for creating and copying colours for (E), the left side and (F) the right side. You can also create new segments and delete them. As always, there are a number of keyboard shortcuts and it is worth getting to know the ones that you use frequently as this can save a lot of time and also a certain amount of getting confused about which mouse key to press to do any particular action. 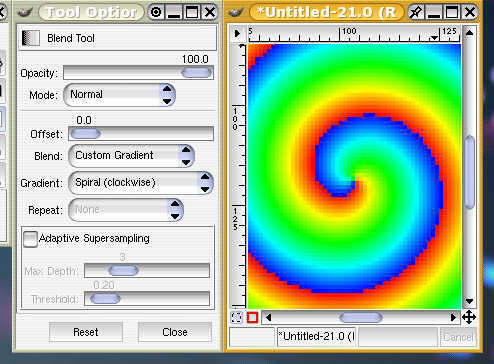 Note that if you create a new gradient, this will appear only on your copy of the Gimp -- other users on the same machine will have their own set of gradients. This has the advantage of keeping everybody's work separate but if you want to share your gradients with another user, you will either have to copy them to a shared directory or have to email them. 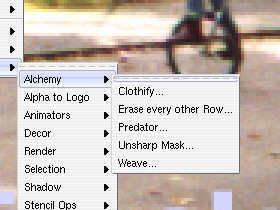 Many of the tools in the Gimp have a number of tool options and double clicking on the toolbox icon will bring up the Tool Options dialogue box -- on the right, we see the tool box for the Transform tool along with the image it is being used on. Also, you can see that for the option that has been chosen, another box has popped up showing what is going on numerically. You can see that there are a number of options for the transform tool that make this effectively four (or more -- depending on what you want) tools in one. Another example is the fuzzy selection tool. To use this, you can either click on a part of the image, the value of which (and all surrounting contiguous pixels) you want to select or, you can click a starting position and then drag the mouse cursor to increase the Sample Merged value. Changing the feather radius will also alter the extent to which it sees neigbouring areas of similar colour. Here, you can make out the purple outline of the selected area using this method. As you drag the mouse across the image, you can see the selected area grow or shrink. To add other areas or take areas away, you can hold down [Shift] or [Ctrl] whilst dragging or clicking. 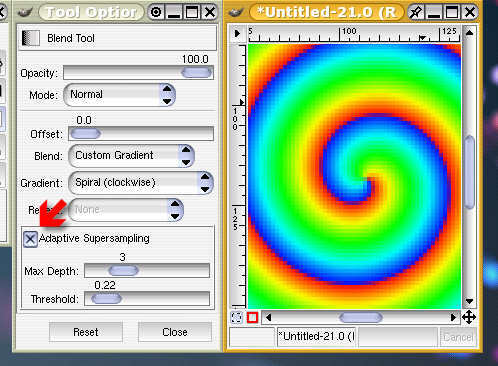 Here, we see a spiral fill with a rainbow gradient. Note that the edge of the gradient -- the part between the red and the blue -- is jagged and not at all aesthetically pleasing. Simply by selecting the Adaptive Super-sampling, the edge of the gradient, the transition from red to blue is smoothed satisfactorally. You will notice that, like many of the tool option dialogues, there are plenty of variables to play around with in order to get just what you want. 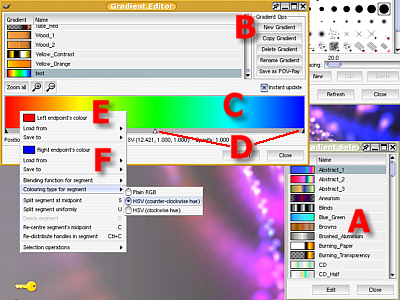 With the gradients, there is an option to specify the opacity of any particular part of the gradient. With the "Blend:" option, you can select "Dissolve". This will may any partial opacities appear as scattered rather than blended in the conventional sense.